I apologize for the delay in postings lately. We're ramping up to have the baby in September. 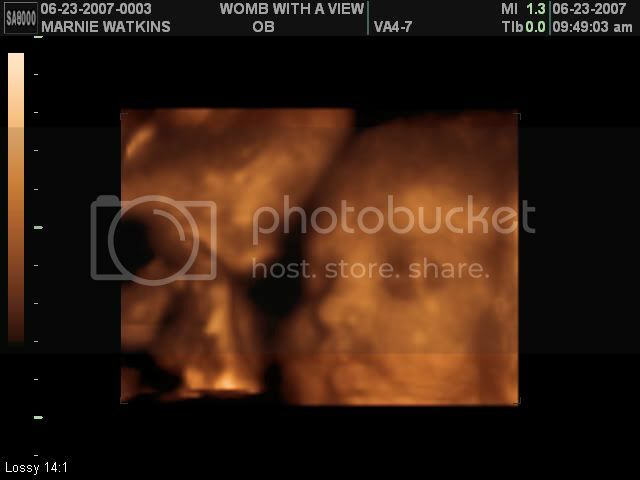 We had a 3D ultrasound last weekend. Man, let me tell you computer technology drives some really cool initiatives. I am getting a little tired of all of the hoopla concerning Apple's latest money maker. It's another smartphone, perhaps a Mac for your pocket, but get on with it already! At work we have taken on a little project to test-deploy Windows Vista to our new lab computers. Now, I have to actually care about Vista. At least that is how a colleague described it to me. For now Vista has been the new version of the arid platform known as Windows. Since August, I have been running Vista Home Premium on a personal machine along with Office 2007. My take is that Vista is "alright", but still pales in comparison to Mac OS X or Ubuntu. Vista is tighter than XP, that is for sure. The new machines we ordered should have enough horsepower to handle the normal operation of Vista and it's "Aero" interface. These computers will be the first of their type joined to the University's Active Directory domain. They play nice with the other computers, they appear in the WSUS server's management console, and allow for authentication by the University's kerberos servers. I am in training this week. A week full of information regarding Windows security. My favorite hemorrhoid, Windows (XP in specific) is the focus of my attention. I am surprised at how many of the other "admins" came equipped with a MacBook & Parallels. The SANS Institute is providing the training. I have to say the course is pretty good. Day 1 was basic stuff I already knew regarding Active Directory and DNS. Day 2 covered Windows Group Policy, the "meat and potatoes" of Windows network security, the end of the day started to get into some tools and techniques I had not seen before. Day 3, today, covers PKI and crypto. These topics can get a bit dry, but are very useful for information security. I made a podcast! A colleague, Chris Sabella, and I made a small podcast. The content is tech-related coupled with a few opinions and the occaisional rant. The sound quality is at the "work in progress" stage, but will improve. What a week! It started out as a traffic nightmare with me spending four hours in the car on Monday alone. Funny, the cause for most of these traffic accidents was commercial tractor trailer trucks. C'mon guys and gals can we keep safe and moving? Paris Hilton in jail, out of jail, back in jail. Thankfully, one judge said enough and sent the little welp back to jail. She should not get special treatment because of her status. If it were you or I who committed her type of offense, we would be locked up in gen-pop at the fullest extent of the law. iPhone pricing finalized with AT&T and Apple. This is a real doozie and just reflects greed and the desire to ride something for all it is worth. An iPhone purchased from the Apple store will set you back $999.99, yup $.01 shy of a grand. Each AT&T store will get 20 phones for the June 29 opener. The 4GB will cost $599.99 and the 8GB will cost $699.99 and the signature of a 2 year contact with AT&T. The carrier is being a bit cagy with the exact specs of what the iPhone can do. Those prices do not get you GPS, a 2MP camera, and limited wireless broadband support. Not to mention the lack of a replaceable battery and if it is anything like a current iPod, that will be an issue. I want an iPhone really bad, but these concessions along with massive sticker shock will have me wait until all of the hype is over and we see version 2.0. I mapped a new domain name to the blog. Is now the new home for Jay's blog. Enjoy!!! Receipts; Do We Need Them? I grab a cup of joe every morning on the way into the office. It's a great ritual, really, but the one questionable part is the end result. The paper receipt the cashier hands me for my $1.67 purchase. It is just a tiny piece of paper, but it tends to linger unplaced in my pocket, then I have to dispose of it. Since I am a security freak, all transactional documents that are disposable must be shredded. Now I have to pay attention to this repeating piece of history twice. I suppose my rant is a little much, but can we just dispose of the receipt in all transient monetary transactions? It is not like I am going to return the coffee if I don't like it. I know I am going to like it, they let me make it myself. I would like to congratulate my friends, Jim and Jamie, on their new addition, a baby boy named Shane. My wife and I have the baby's room just about ready. All we need to do is add furniture, then baby. Windows Home Server (WHS) is still chugging away. I do not use it as much as I probably should. I run a mixed-mode environment with Windows at the tail end of things. Not to mention, this copy is time-bombed, so that rules out placing all of my data there anyway. Besides that WHS is a nice product. I do wish there was stronger Windows 2000 support from WHS or Microsoft for that matter. Resetting passwords, fixing printers, applying updates. I even retired an old Windows 98 computer, the last of it's kind, in my charge. By Windows 98, I will not miss you in any way shape or form. The host computer is fine, if not a bit old. I plan to SpinRite the disk and install Damn Small Linux (DSL) on beige Dell XPS450 Pentium II.